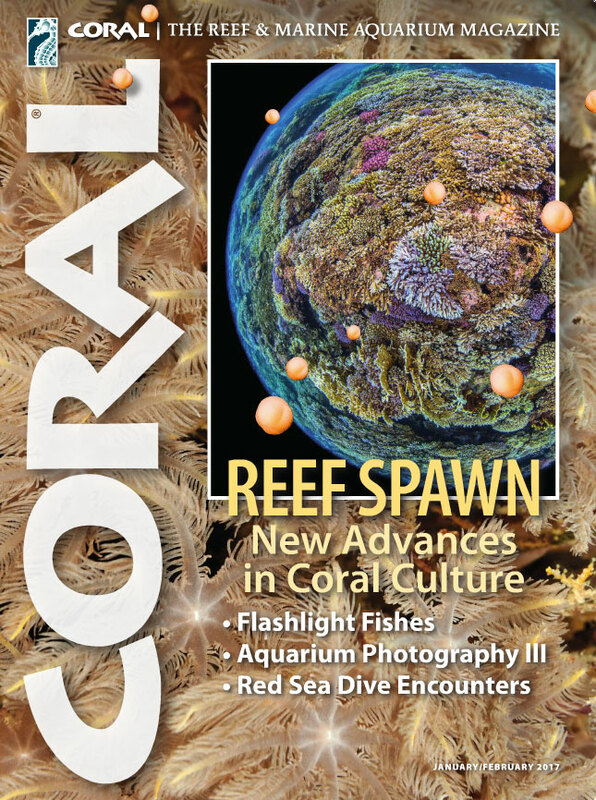 The January/February 2017 Issue of CORAL Magazine is printed and now being delivered to subscribers, local aquarium shops, and select bookstores. On sale date: January 3rd, 2017, at the best marine aquarium retail stores and leading Barnes & Noble stores everywhere. HEREWITH: a sampling of articles and opening pages for readers curious about what the issue will bring. 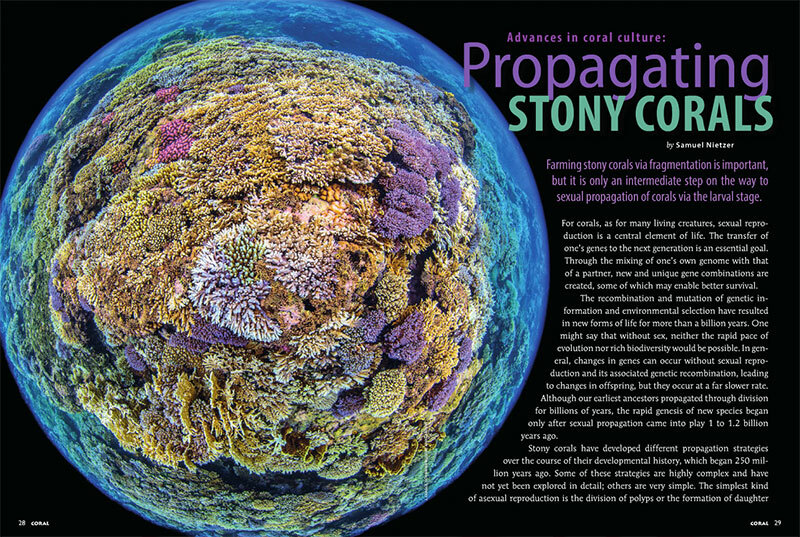 “So far, no one has mastered all the complexities of coral sexual propagation on a scale suitable for farming, but this is exactly what marine biologist Samuel Nietzer reports on in this issue of CORAL. I am very pleased that Nietzer’s articles on such a positive development are being published in this 100th issue of KORALLE (the 78th CORAL, in English)…I would like to thank our numerous authors all over the world and you, our readers, who have been loyal to us for nearly 17 years. 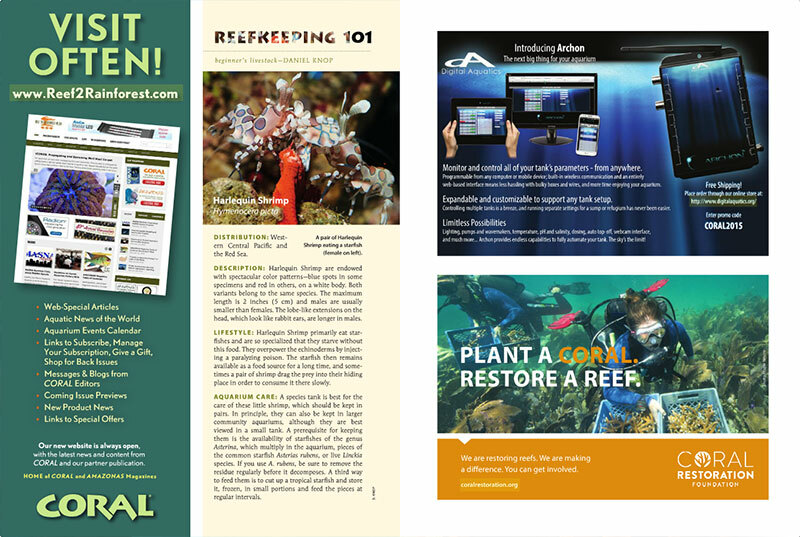 Enjoy the read!” – Daniel Knop, CORAL International Editor. Also shown, the Table of Contents. 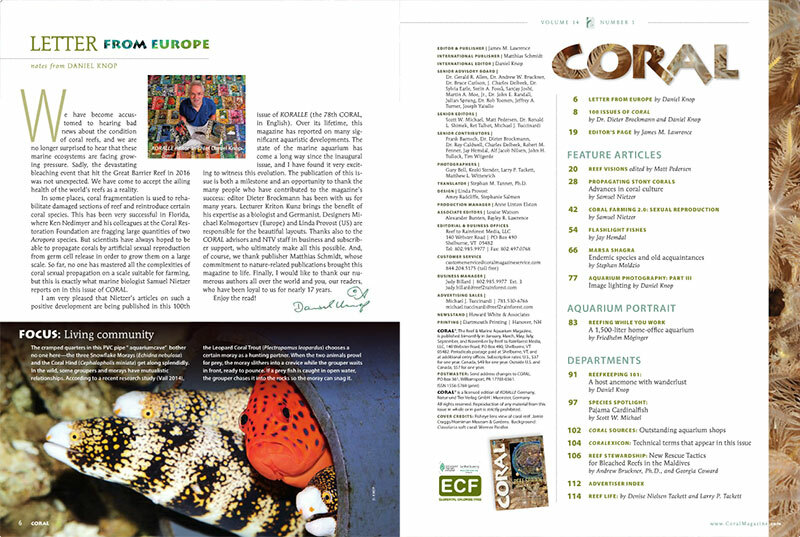 CORAL, in its original German form KORALLE, has crossed the 100-issue milestone. 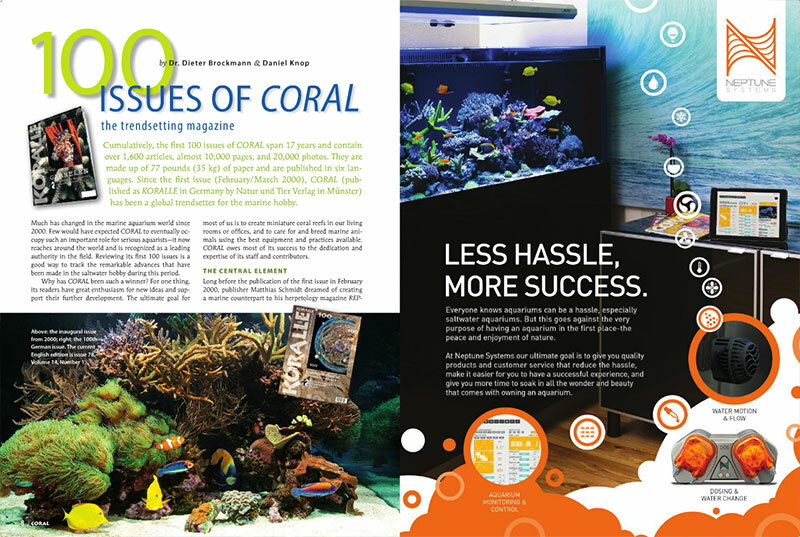 Cumulatively, the first 100 issues of CORAL span 17 years and contain over 1,600 articles, almost 10,000 pages, and 20,000 photos. They are made up of 77 pounds (35 kg) of paper and are published in six languages. Learn more in the 100-issue retrospective. 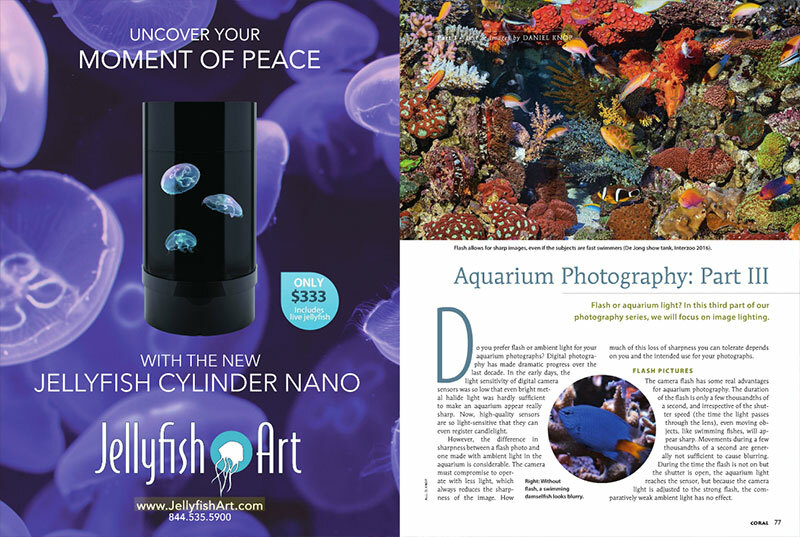 “Our most intrepid New Year’s Resolution for 2017 is to try to spark support for an initiative we have dreamed about but punted down the road for several years: finding ways to inspire the next generation of marine aquarists.” – James Lawrence, CORAL Editor & Publisher. 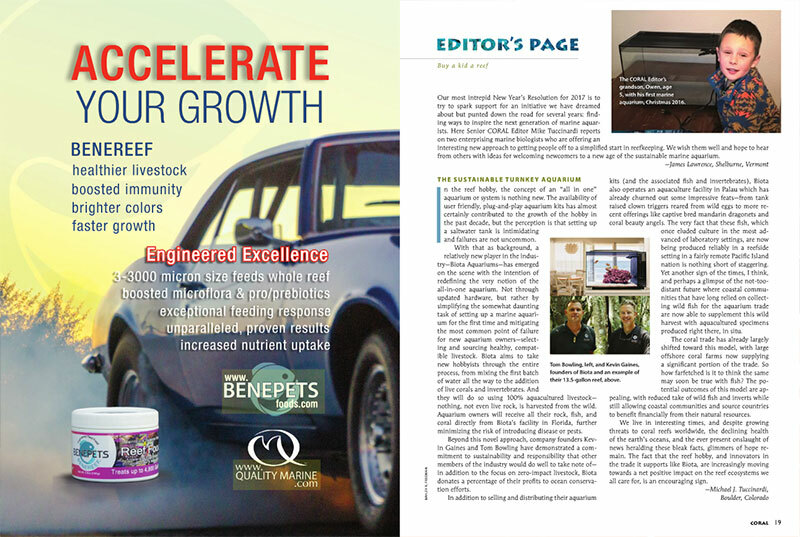 Learn more on the Editor’s Page in the current issue. 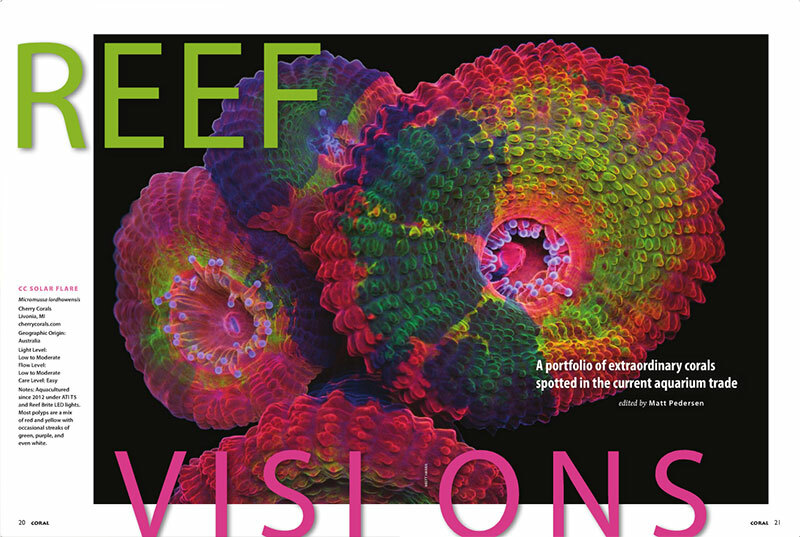 Check out the incomparable corals you’ll find in CORAL Magazine’s REEF VISIONS! Selected from the best of the best, and only in the current issue! 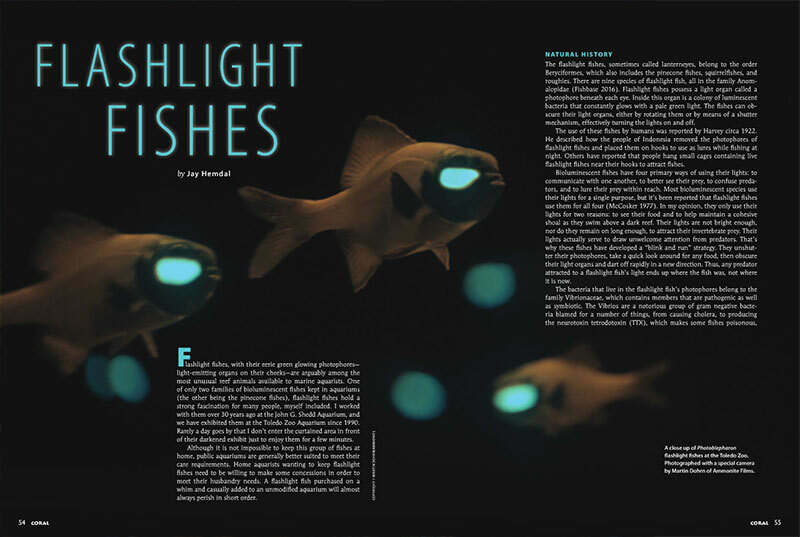 “A flashlight fish purchased on a whim and casually added to an unmodified aquarium will almost always perish in short order…Home aquarists wanting to keep flashlight fishes need to be willing to make some concessions in order to meet their husbandry needs.” Learn how to succeed with this comprehensive guide, “Flashlight Fishes,” by highly experienced public aquarist Jay Hemdal. 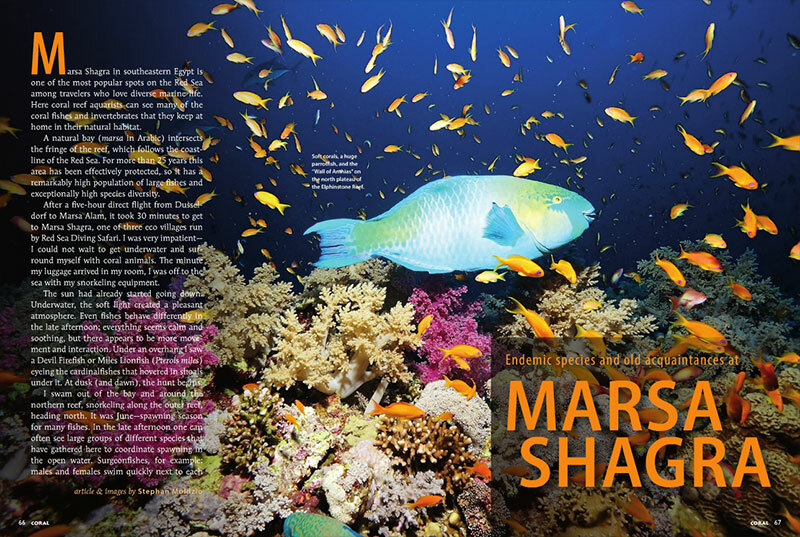 Dive in and meet “Endemic species and old acquaintances at Marsa Shagra,” as recounted by Stephan Moldzio. Daniel Knop’s series covering aquarium photography continues, this time asking, “Flash or aquarium light? In this third part of our photography series, we will focus on image lighting.” Don’t miss it. 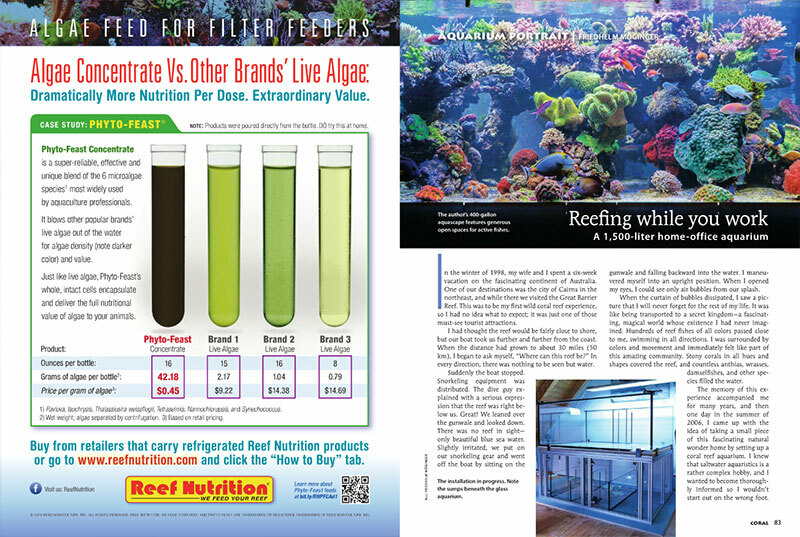 Reefing while you work: the 400-gallon (1,500-liter) home-office reef aquarium of Friedhelm Möginger is this issue’s Aquarium Portrait. 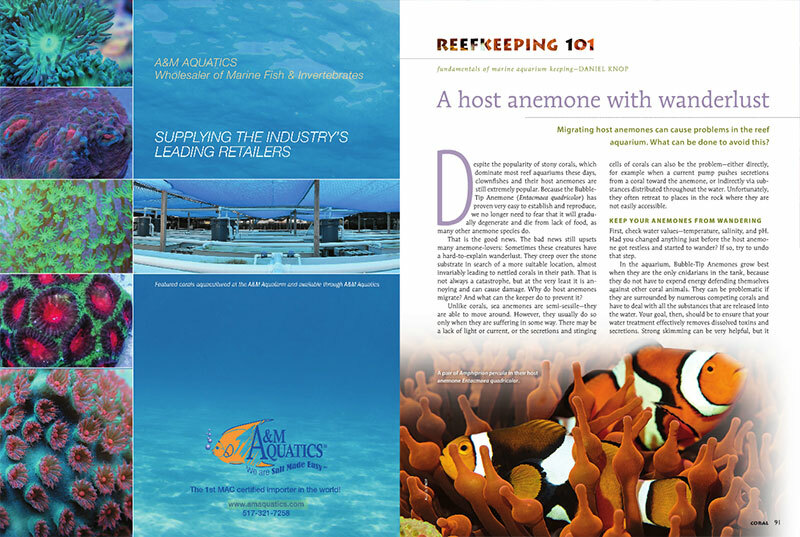 Danial Knop takes a quick look at the Harlequin Shrimp, Hymenocera picta, in Reefkeeping 101. 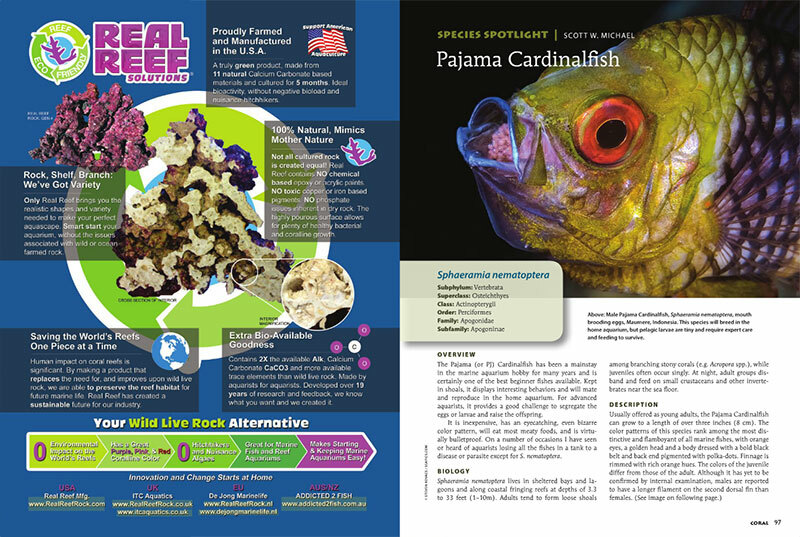 In the Species Spotlight this issue, the Pajama Cardinalfish, Sphaeramia nematoptera, with insights from CORAL contributor Scott W. Michael. 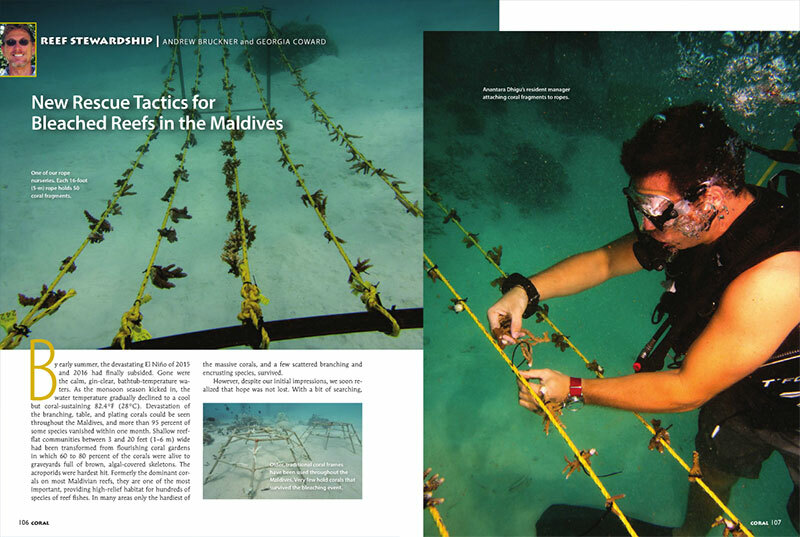 Andrew Bruckner and Georgia Coward present “New Rescue Tactics for Bleached Reefs in the Maldives” in our continued coverage following the devastating El Niño of 2015 and 2016, which left shallow reef-flat communities transformed from flourishing coral gardens to graveyards full of brown, algal-covered skeletons. Learn more in the new issue. • SUBSCRIBE and never miss an issue of CORAL. Paid subscribers receive the classic Print Edition, as well as Free Access to the Digital Edition and CORAL Apps for mobile devices—via iTunes, Google Play for Android devices and the Amazon Kindle store.